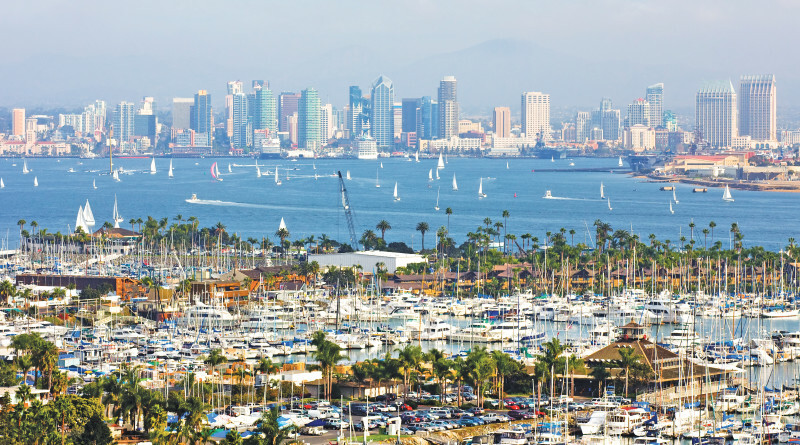 An incubator plan might boost district’s efforts to improve San Diego Bay’s water quality. SAN DIEGO — Enacting a Total Maximum Daily Load (TMDL) policy might not be the only way to reduce copper levels in San Diego Bay – or any other harbor for that matter. The Port of San Diego, angling to be on the cutting edge of environmental policy, is moving forward with its efforts to reduce copper pollution in the harbor by relying upon blue tech innovation. Potential breakthroughs in developing copper reduction technology and non-copper boat bottom paints could be fostered by the port district’s incubator plan. The plan, consistent with Blue Economy principles, would direct investments into the creation, development and initial sustainability of environmentally friendly policies. Port district staff hopes to achieve its vision by combining investments in sustainability projects with copper reduction technology. San Diego has been addressing copper pollution in its harbor since 2005, when the Regional Water Quality Control Board enacted a TMDL policy. Port officials are required to achieve a 76 percent reduction in copper levels at Shelter Island Yacht Basin by 2022. About 98 percent of copper loading at Shelter Island Yacht Basin came from antifouling paints on recreational boats, according to port district staff. A five-step plan was incorporated to address copper pollution at Shelter Island: test and research alternatives; develop policy or legislation supporting copper remediation; educate and reach out to boaters about alternatives; and, monitor/assess data to see what does or does not work. “The goal of the RFP was to provide research and development funds that promote the advancement or improvement of environmentally sustainable business practices and/or technologies that reduce copper and improve water quality,” port district staff stated. Seven proposals were submitted. Suggested copper remediation techniques included active/passive water filtration, bioremediation and hull clean capture systems. Port district staff ultimately determined it could identify a pilot project to pursue long-range solutions through an incubator plan. Discussions are currently in play, according to port district staff, with Red Lion Chem Tech Inc. and Rentunder AB to pursue copper remediation opportunities. “Staff has initiated discussion with [Red Lion Chem Tech and Rentunder] … so the copper reduction technology could be considered as initial pilot projects for the blue tech incubator,” port district staff stated in its report to commissioners. A proposal for incubator partnership could be in front of the board by spring 2017. The port district is also pursuing new business proposals for blue tech innovation. District staff explains “blue tech” as “the advanced technology sector of the maritime industry” driving innovation within the growing Blue Economy market opportunity. A “Blue Economy,” according to port staff, balances economic opportunity with responsible investment in a sustainable ocean economy. Opportunities in blue tech innovation and aquaculture have been at the top of the port district’s strategic plan to engage in long-term marine planning and environmental stewardship. “The aquaculture and blue tech incubator programs will serve as cornerstones for district’s Blue Economy vision and create an environment in which innovation can excel, by providing ocean entrepreneurs with key assets, such as land and water entitlements, permit-ready infrastructure, marine spatial planning tools, regulatory expertise, and mentorship,” port district staff stated.